As part of Oz Moving & Storage’s “Moving Tough Stuff” blog series, we talked to our very own Yossi Weissman, the dispatch manager for Oz Moving & Storage. On a day-to-day basis, Yossi works with our team of dedicated and hard-working movers to ensure they have all the intel and tools needed to complete a job including how to move a piano. Since Oz moves pianos, we figured Yossi would like to educate the public on how to move a piano. Make sure to use qualified professionals who know what they’re doing - a piano can be a very fragile item! Put cloth over the keys, then close the keyboard cover. You need to make sure the keys are protected by padding them in some way. Cover the front with cloth and tape it down. You’re going to be using a lot of tape to make sure the front of the piano is adequately covered. Put a blanket/cloth over the top of the piano (towards the back), but ensure the handles are the back are exposed and accessible. You’ll need to use these handles to carry the piano. Without these handles, you will likely need to use a piano board. Cover the sides with blankets. Again, you’re going to be using a LOT of tape. Any part of the lacquer should be covered, but the handles should be exposed. Secure again by taping blankets around the piano. Make sure that none of the blankets are loose on the piano. You should have these blankets secured with eachother across the piano. Lift the piano up with a dolly to tape blankets on the bottom. Yes, you need to cover the bottom too. While the piano is propped up on the dolly, use cardboard to cover the pedals. This will ensure that any weight applied to this area will have its force equally distributed. Be aware what man power you need. A very heavy piano may require up to 4 people to move. You probably won’t be able to fit 4 people on a staircase, so moving those heavier pianos may require a piano board. Pick it up and move. Always be aware of clearances and potential pitfalls before you move a big bulky item like a piano. It pays to have a plan, in the sense that you won’t need your doorhinge repaired. 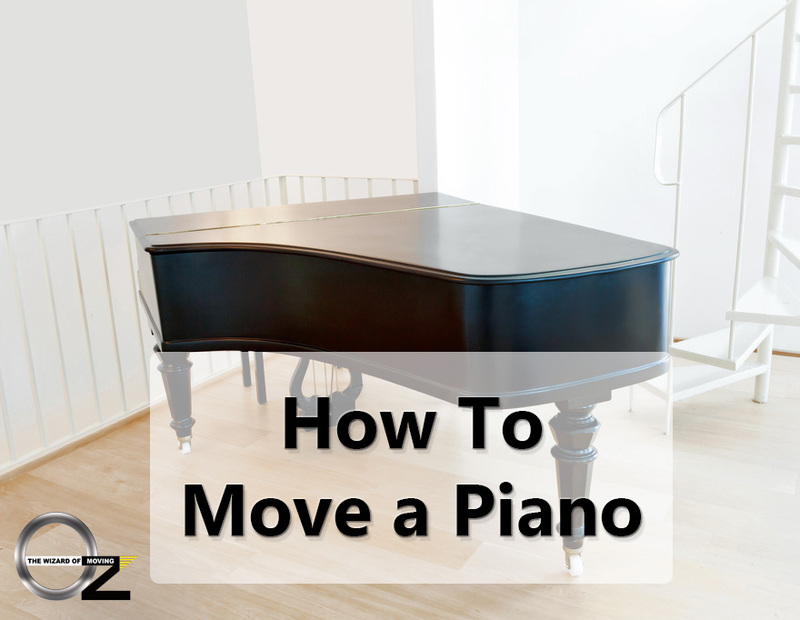 Unfortunately, moving a baby grand piano is a bit more complex, but follows a lot of the same steps. Yossi layed out the necessary steps to us. Put a blanket over the interior & under the wing. Any wood on wood or lacquer-on-lacquer contact needs to be buffered by a protective cloth or blanket. Take off the music stand. If applicable, move the music stand separately. Use a phillips or a socket head to take off the pedals. The pedals should be connected to the piano via a rod that you can pull out of the bottom. A china box should be able to fit the pedal mechanism well. Cover the keys with cloth, then close the key cover. Same thing as an upright piano. Cover everything with blankets and lots of tape. This is getting pretty familiar. Get a piano board. The piano will otherwise be too heavy, too big and too difficult to carry. Take off the leg on the side with the curve. There are two distinct sides on a baby grand piano - a flat side, and a side with a curve. The first leg you need to remove is the one on the side with the curve. Tilt the flat side gently onto the piano board. You should have at least 2 people on the flat side to gently lean the piano onto the piano board. Take legs off, and wrap them in tape & blankets. Make sure not to forget to protect your piano's legs as well. Determine who will re-tune your piano. Some dedicated piano movers will have designated piano tuners that will re-tune a piano after a move. (It's not going to be in tune after being moved, trust us.) You can try to re-tune it yourself as well, or maybe reach out to a friend. Movig a lot of tough stuff? Check out our guides on How to Move a Hot Tub and How to Move a Safe. Follow Oz Moving & Storage on Social Media!